I don't know if other people have noticed this trend, but a lot of DS games will somehow, someway, try to add a subtitle involving the letters D and S. Sometimes it works wonderfully, but sometimes it doesn't. Deadly Silence? Good. Dual Strike? Eh, it's okay. Dust Strikers? Okay, that's one that doesn't make any sense. That doesn't matter though, because Majesco's Guilty Gear: Dust Strikers is another entry into the venerable Guilty Gear series, and it doesn't disappoint. Luckily this doesn't prove to be a hindrance to your performance because the action is so fast. Still, you have to wonder why they didn't just make the entire field scroll; the Guilty Gear games are renowned for having some of the best 2D visuals in a fighting game, and it's a shame that the sprites were cut down in size to accommodate the game. The game for all intents and purposes plays the same as your regular old Guilty Gear game, albeit with a few changes in the control scheme. Instead of the four attack buttons in previous games, there are now only two attack buttons, Weak and Hard Slash. To make up for the omission of the other attacks, combatants can execute a Dust Strike, which sends opponents flying to the tier above or below the attacker. There's also a button dedicated to special attacks -- apparently, someone did their homework and realized that the directional pad on the DS is totally not suited to Street Fighter-esque motions, and decided that a permanent special attack button would be better. The triggers on the DS are used for Psychic Bursts (allows you to escape combos) and Roman Cancels (cancel out of a special move), instead of the traditional three button combinations they used to be in other Guilty Gear games. In addition, there are several items that are scattered around the battle field that will help you in your battle, or work against you. You have your typical health power-ups and such, but you also have a funny little item that switches the positions of every player on the field from the top of the screen to the bottom, and vice versa. The items themselves are activated by using the touch screen, and it's really the only time you'll use it in that fashion during a real fight. By design, the game is a multiplayer affair, but the single-player experience isn't anything to scoff at either. You have a standard Arcade and Story mode, but the real treat is in the mini-games and the Robo-Ky factory. The mini-games are all played using the touch screen, and feature miniaturized versions of your favorite characters. In one game, you'll control a mini-Jam as she tries to catch all items that her chef friend throws up, and in another game, you will arrange musical notes that emanate from I-no's guitar. All of the games are simple to get into, and are quite fun to play. What's more is that by attaining higher scores in the mini-games, you unlock parts and moves for the Robo-Ky factory. Robo-Ky is one of the playable characters in the game, but via Robo-Ky Factory, you can arrange your special moves and super combos. You can even unlock hidden moves that are taken from other characters, such as Potemkin and Bridget. This is a neat feature, but ultimately it's not that deep, because you can only arrange which moves you want to use, and their button assignment. If you were able to steal normal moves as well, then it would've been much cooler, and deeper. 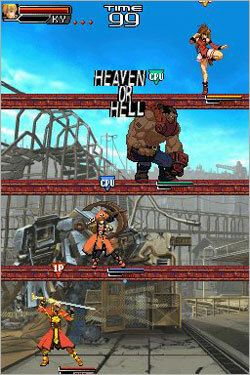 Visually the game is strong, and it retains a lot of the key animations that the Guilty Gear series is known for. Like I said before, it's a shame that the design of the game forced the sprites to shrink to a miniscule size, because this is one of the few high-res 2D games on the market. Having said that, the game still moves extremely fast with no slowdown anywhere. One thing that I do have to criticize is the lack of imagination when it comes to level design. Other than the background, all of the stages are exactly the same. You have four tiers that span the entire level, and that's it. Given that this isn't a tournament-style game, the developers could've had a little more fun by varying up the levels a bit by throwing in moving platforms, walls and so on. As it stands however, the game does get boring after a while because each fight is the same as the previous ones. Thankfully, the multiplayer aspect of the game is well done, and really enjoyable despite the level design. There isn't any single card multiplayer (it's strictly 4 player multi-card play) but the game moves faster than any similar fighter on the system, and makes for some intense matches. Sadly, there is no WiFi compatibility, and given the game's small fan base, implementing it would've been a smart move. As it stands, multiplayer games are fun, but you might have a hard time finding someone who actually has the game. With tasty graphics and a finely-tuned battle engine, Dust Strikers is another quality entry into the Guilty Gear series that while not offering anything new (or better) than other DS fighting games, is still an enjoyable game. If Majesco and Arc Systems can fine-tune some of minute details that are present in the game (most notably the stage design) then this series could be a real contender on the DS.